All casitas with front porches have furnishings similar to this. 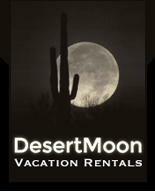 Desert Morada is our newest property. Located in town near the Tucson Mall. Desert Morada is comprised of 12 garden duplexes around a refreshing pool. Casita E is 850 square feet and remodeled in a contemporary style with 2 bedrooms, one bath with tub, and a separate laundry room overlooking the pool with the Catalina Mountains in the distance. Each casita has 42" flat screen smart TV with cable access and high speed wifi. The fenced back yard is accessible through one of the bedroom's sliding glass door. Other there you will find a patio with outdoor furniture under a canopy of mesquite trees. The casita comes fully furnished including linens, towels, and beach towels for the pool. Parking is onsite and secure. You will be provided with a remote for your vehicle so you can come and go with ease. The exit gate opens automatically as you approach it. All casitas are dog friendly but must be approved ahead of time and a pet fee of $5 per day per dog is required. We do not allow other types of pets. Base rate is for double occupancy. Additional guests are $15 per night per guest-this includes kids and babies. We do allow dogs-no other pets. There is a pet fee of $5 per day per pet. Please notifiy us of additional guests or if you are bringing any dogs. Failure to pay additional fees before use will result in doubling the cost of the fee and could result in immediate eviction.